I’m always amazed at the range of answers I hear. Some will say, “you shouldn’t resize at all”, some preach safely 10% up or down, others 20%, or 30%. Some resize to the point that there is no limit. The reality is that there is no one single correct answer because every design is created differently. 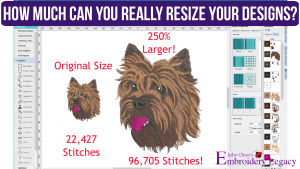 To answer the question “how much can I resize” we must first establish a solid foundation of embroidery’s rules. Personally, I think it would be in every embroiderer’s best interest to learn some basic theory about how designs are created and the foundational rules before they even get behind the seat and start driving. 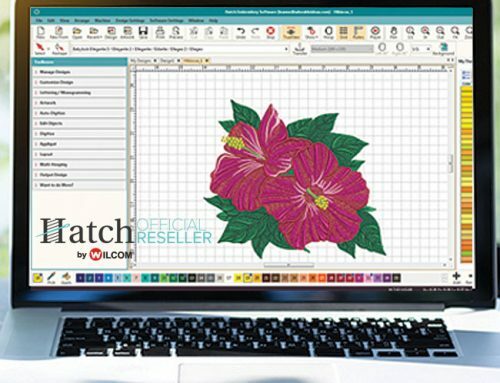 For this reason, if you haven’t already I highly suggest you click here to access our free Embroidery Digitizing 101: Cheat Sheet video course. Those of you who have been doing embroidery for a while will agree that there is a bit of a learning curve when you first get your machine. I sometimes feel sympathetic for sewing machine dealers when customers leave with their first machine in hand. Many of them go online and download all kinds of “free” designs, load them into their brand new machine and quickly find out first hand that all designs are not created equal. The problem is that they’re so “new” to embroidery that they don’t understand that it’s the designs that are causing their machine to run poorly, break threads and create birds nests every 10 seconds. All the customer knows and thinks is that “this machine they sold me is a piece of garbage!”. It’s important to understand that a machine is much like our own bodies… put garbage in, get garbage out! Put good stuff in, get good stuff out! Not all designs are created equal which is why I always suggest embroiderers find and stick with design companies that know what they’re doing or learn digitize and do it themselves. Less aggravation, and more importantly, better results. If you’d like to try one of my embroidery designs free, simply click here. We have over 26,000 to choose from. Each of these stitch types has specific rules that apply to them. Just so this doesn’t become a long drawn our lesson on theory, we’ll just look at the running stitch for now. 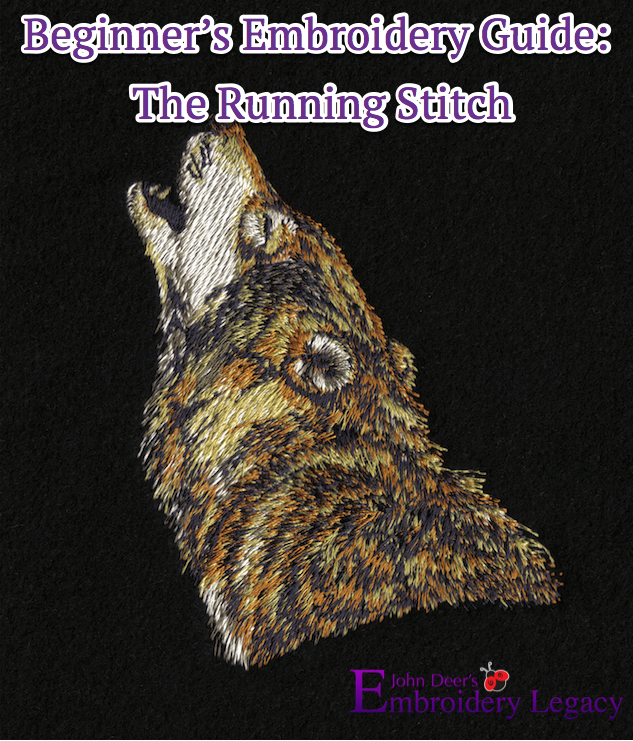 There is really only one thing you can control with regards to settings/properties within a running stitch, which is the stitch length. How far the needle travels between each stitch penetration. There is a minimum and a maximum, but please keep in mind that even these rules can change depending on the fabric type being applied too. The absolute minimum would be .5mm, which means the machine would stitch every half a millimeter… which is pretty small. We need to remember that embroidery machines like movement within the frame. If a needle stitches in the same place repeatedly you are pretty much guaranteed to get thread breaks. Also, small stitches will assist in creating stitch intensive (or “bullet proof”) designs. This is one of the biggest culprits of poorly digitized designs, way too many stitch penetrations too close together! One thing I love about the Hatch software (click here to download a 30-day free trial) is that it has safeguards automatically built in. 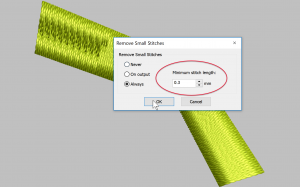 The software has what is called a small stitch filter that automatically looks for any stitch penetrations that are under .3mm (default setting) and when you export your design to your desired machine format it will automatically get rid of any stitches that might cause problems. 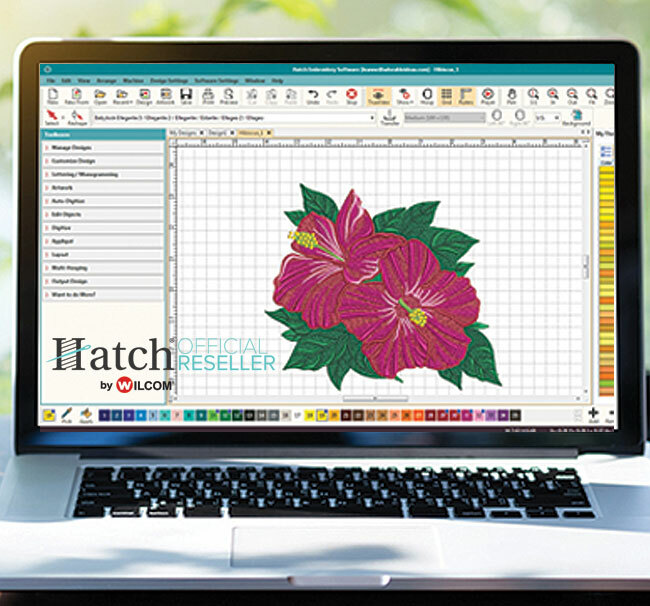 I repeatedly hear Hatch users who’ve transitioned from other programs say: “Hatch creates designs that are so much softer than my other software did”, this is one of the reasons why. If .5mm is the absolute smallest then 1mm is safe and 1.5mm is what I personally aim for when I’m creating designs. I know a 1.5mm stitch will always embroidery smoothly on my machine without creating and hard stitches. Now that we’ve covered the minimum let’s look at the maximum. 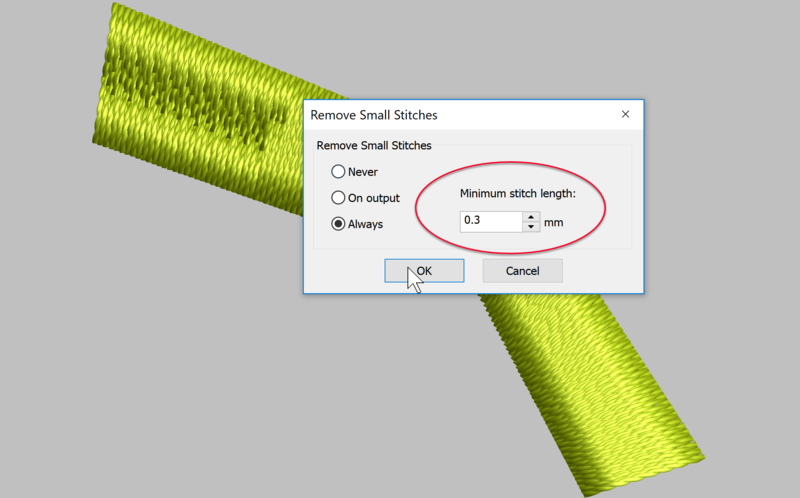 Maximum stitch lengths of a running stitch is a double-edged sword as there are really two sets of rules to consider… Is it a wearable or non-wearable item? Wearable items are laundered frequently which means that if the stitch length used is too long the embroidery will eventually lose its integrity and start to look worn and loopy. That maximum stitch length you’d want to use on a wearable item is 7mm. You can go longer but it’s asking for trouble. 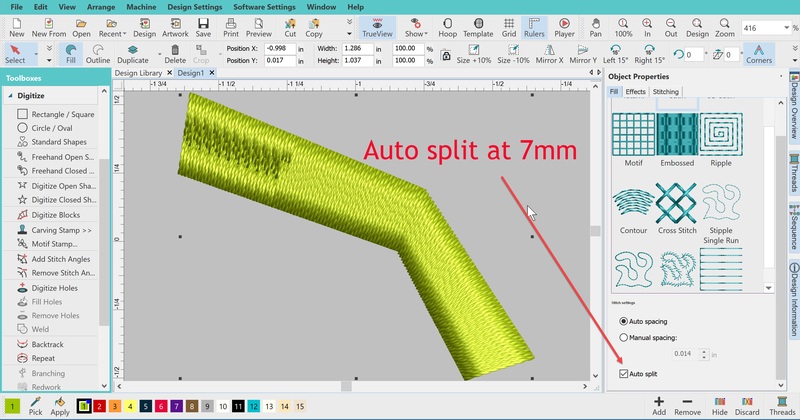 Again, one of the auto-pilot features I love in Hatch is the “Auto-Split” feature, this ensures that when you have it clicked “on” the software will automatically “Split” any stitches that go over 7mm while you are in the digitizing process. 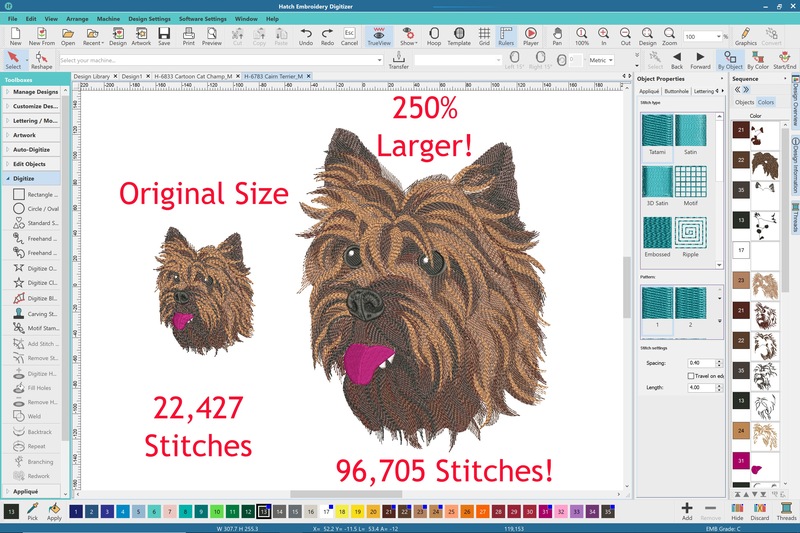 This is an awesome feature and is again a real safeguard to ensure the user is creating embroidery friendly designs without having to think about it. Now you can see that by being armed with just the foundational rules of a running stitch, we can already start to assess how limitations within designs can vary. Because every design is uniquely different with regards to how it was initially created will dictate how much it can be re-sized up or down. One thing I would like to point out is that a design does usually have a much better rate of success going up in size as opposed to down. If a design has been digitized with very small details or very small text the odds of resizing are very little. All you’ll do is create hard stitches and poor quality results. If an object that consists of running stitches already has a .5mm stitch length, then decreasing the overall size will cause hard stitches and potential thread breaks. As I said before, the machine will almost be stitching in the same position over and over again. The same can be said if you have a larger design that already has a lot of stitches that are at the 7mm stitch length (which is safe for a wearable item). Increase the size just 20-30 percent and you’ve created stitch lengths that are no longer suitable for garments. Blow the design up to double the size and those 7mm stitches become 14mm stitches and you now created a design which might have sections with “invisible embroidery” because they’ve gone past 12.1mm and forced trim command on the machine. So if you want to learn how to assess how much a design can be increased or decreased just acquire a foundation regarding the fundamental rules of stitches. It is well worth the time and effort as it will help you get past the learning curve and eliminate frustration. 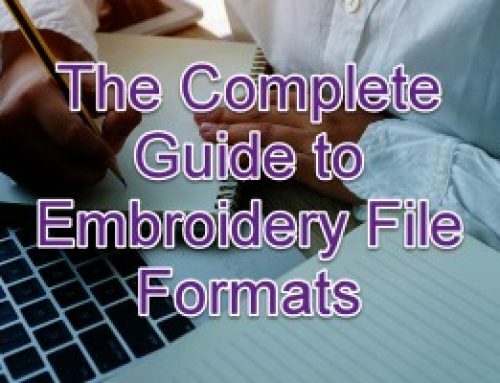 Over the years I’ve developed numerous educational resources covering basic theory and explaining embroidery terminology in a way that is easy to understand. One great resource is the book I wrote almost 15 years ago called “Digitizing Made Easy”, it has actually sold almost 45,000 copies and is still relevant and in print. To this day, this book is used in Universities across the United States to teach students studying textile. Like many things these days Amazon is the go-to place to order it if you’re interested. Now if you’re looking for faster results, I highly suggest you click here to checkout our hands-on Digitizer’s Dream Course. 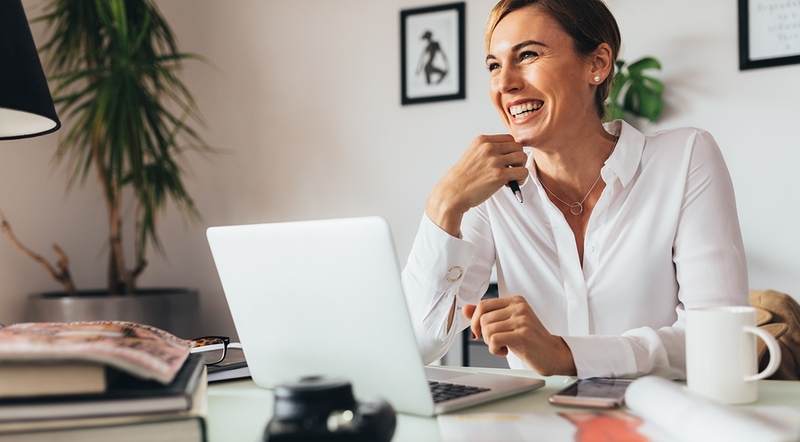 This fan-favorite online course is taught in 10 of the industry’s leading software brands and will get you past the learning curve both quickly & easily using interactive lessons. Now that I’ve gotten you to a place where you might be saying “ahh, I get it!” I’m going to throw you a bit of a curveball. Limitations with resizing are much more dramatic when you are dealing with a “machine format” compared to a “native format”. 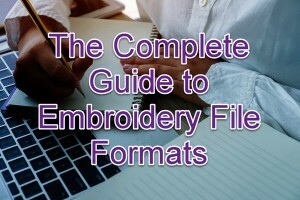 If you’re not familiar with the differences between embroidery formats click here to read a past blog that explains it all. A machine format like PES for example brought into an embroidery program will have some limitations with regards to changing properties and stitch types within a design. You can edit a machine file within any software program and make changes to achieve good results. However, you do really have to know your stuff and many times you can spend more time editing a file than it would take to redo the design in the first place. Expanded and machine file formats will always have more limitations when it comes to resizing and editing your designs. Now the other side of the coin is that if you have a native file format that you can load into the program you actually own (for example .EMB and Hatch) then making changes, editing and resizing a design becomes much easier because the software will create much smoother results. If you purchase most of the designs you run on your machine the odds of purchasing a native file that is native to the software you own will very rarely happen. If you digitize your own designs it is very important that you save your “master files” in the format that is native to your software. You will always get much better results. 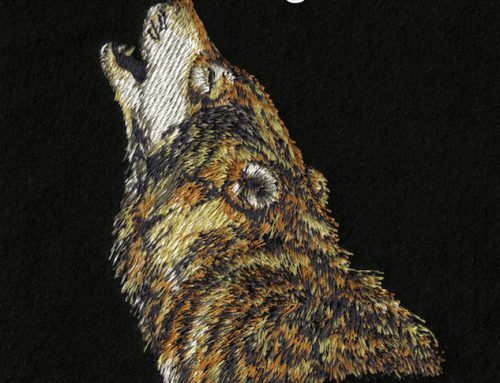 Over the years I’ve also changed the “old-school” digitizing technique I was taught when I first began to evolve with the progression of today’s embroidery software. It promotes better results knowing that the tools I use within my Wilcom Hatch software are truly object-based. 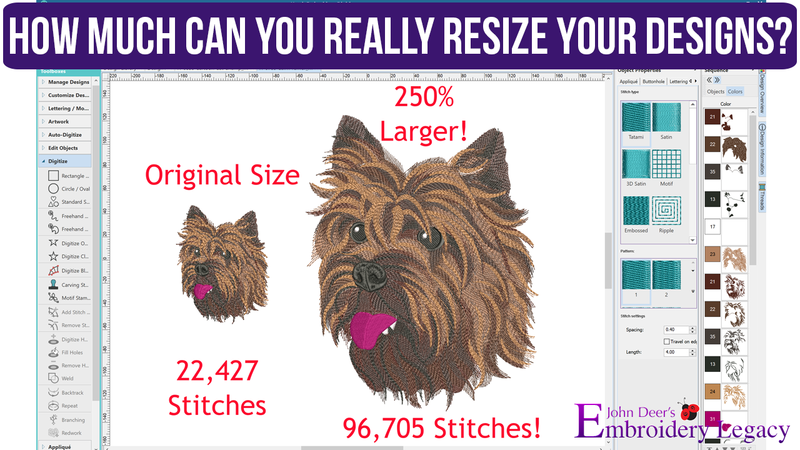 This makes embroidery files just like vector artwork files in that they can be resized beyond what you’d normally think possible. 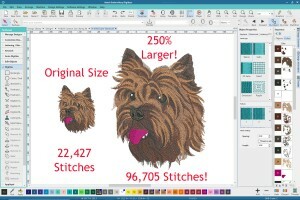 Here is a “Terrier” design I digitized that ended up being 4” in height and 22,427 stitches. Then I did the unthinkable, I increased the design 250%, making it over 10” in height and 96,705 stitches! The results speak for themselves. This once again backs up the fact that having a solid foundation and the right software, are the difference between having successful results or frustration on the machine. Most machines will automatically trim when a stitch goes over 12.1mm. Hopefully now you better understand why learning the theory behind machine embroidery is so important. I’ve always told my students that although software has certainly evolved and changed throughout the years, the age-old rules of working with thread and different fabric types hasn’t. If you’d like to continue to learning this theory, I highly suggest you click here to checkout my Digitizer’s Dream Course now. 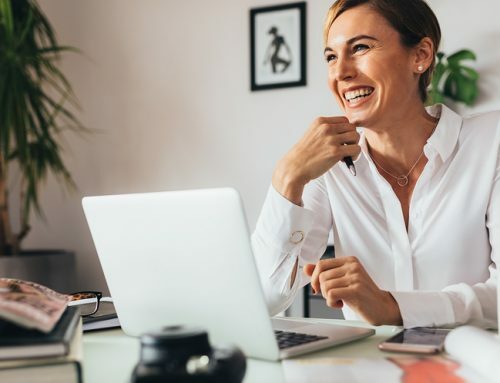 Even if you don’t want to fully digitize and create your own designs, learning the rules behind it will help you resize, edit and better pick out quality designs. Truly understanding what’s happening beneath your needle will help improve EVERY aspect of your machine embroidery. Also the type of stitch. When we create radials or ripple stitches then resize smaller it is important to look at where the highest concentration of stitches is. When you look at it in stitch view does it look like a million stars just landed on your design? Then you are going to have a birds nest or your fabric will bunch up right there. Thanks for your advice . It reaaly helped me to understand and solve problems. Happy to hear it helped. My pleasure Martha! Would love to know where to purchase the “terrier” design! You’re most welcome. Glad you enjoyed it Heather! My pleasure Mark, glad it helped! Can you let me know about when I will get this course. Please just make sure you’re logged in before visiting the URL above 🙂 Enjoy! I have signed up for the Digitizing workshop May 18 and 19. Would it be helpful to take the Digitizer’s Dream Course first or would it be redundant? Hi Bonnie, congratulations on signing up for the workshop! It would certainly be helpful. There will be some overlap in the content found in the Dream Course & the workshop, however it would be good to be able to ask any questions you may have live if you’ve already taken the course.